Nick Foles joins "Jimmy Kimmel Live" on Feb. 15, 2018 to talk about Eagles Super Bowl win. If Nick Foles truly plans to become a pastor in a future life, it sounds like Eagles fans have been giving him useful practice in the stirring days since Philadelphia sealed its first-ever Super Bowl victory. The backup-turned-MVP is in the midst of a whirlwind press tour that has taken him all over the country in recent days, including a heartfelt appearance on "The Ellen DeGeneres Show" earlier this week. 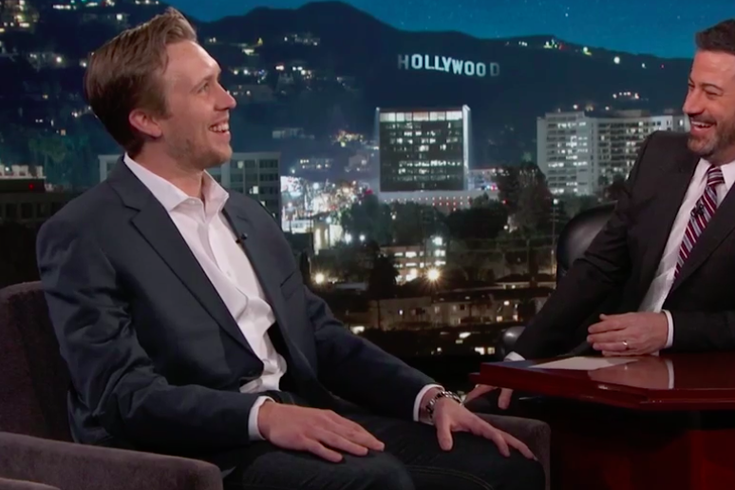 On Thursday night, the mood was lighter when Foles sat down with Jimmy Kimmel in Los Angeles for another interview about the emotional roller coaster he's been through over the past several weeks. "Do you meet Philly fans out here in L.A.?" Kimmel asked. "Because there are a lot of them." "Oh, everywhere," Foles said. "Everywhere we've been, there's been a ton of Eagles fans, which is awesome." "What do they do when they see you?" Kimmel continued. "Most of the time it's ... cry," Foles said. "It starts off as a normal conversation and then it turns into tears. And everyone asks me, well, what do you do? And I simply just say, 'I understand.' Trust me, I've been in Philly. I get it. I get it. I know. And it means a lot. And the fact that the whole city, everyone cried and is so emotional, that's what was so special to us to be a part of winning this thing and bringing it back home to where it hasn't been." Kimmel also broached the subject of Patriots quarterback Tom Brady snubbing Foles after the end of Super Bowl LII by leaving the field before shaking his opponent's hand. "Did you hear from Tom Brady after the Super Bowl?" Kimmel asked. "I haven't heard from him yet," Foles said. "I know he's busy. I know he's got a lot going on." The late-night host pointed out that Brady was the last backup quarterback to win the Super Bowl. "Yeah, I mean, I didn't hear from him, but I will say this," Foles offered. "As soon as the game's over, you can't move. You can't even express emotions. There's so many cameras. I mean, you have to have a blocker in front of you. I was about to get Jason Kelce and say, 'Hey, bro, can you come with me for like five minutes, be a good presence and just block, block." Kimmel says the solution to this is simple: Tom Brady needs to send Nick Foles a pair of Uggs. The champ just has to be on the lookout for a pebble inside.